Since these first images came in, astronomers have debate why Comet 67P looks this way. They have two ideas: either the current nucleus is the product of two separate ones that gently collided in the outer solar system and stuck together, or so much material eroded away from the neck region that it narrowed into a column. The Rosetta team now says they have the answer, and it’s that the comet was born when two nuclei became one. Matteo Massironi (University of Padova, Italy) and colleagues used images from the narrow-angle and wide-angle cameras of Rosetta’s Optical, Spectroscopic, and Infrared Remote Imaging System (OSIRIS) to investigate the nucleus’s origin. Some of these images reveal features down to 0.1 meter (0.3 foot) across, showing a nucleus akin to frozen putty, covered with terraces, pits, and cliffs. Click here for an infographic on the team’s analysis. It’s these features that the team took advantage of. With OSIRIS, the scientists peered down into pits and along terraces and found strata, layers of material like those you would see in rock on Earth, built up as the rock formed one layer at a time. Many of Comet 67P’s layers extend 150 meters or deeper, in some places reaching 650 meters down. You can think of them like the layers in an onion, the team explains September 28th in Nature. The layers are too flat to be material rained down on the irregular surface after its formation, so like terrestrial strata, they were probably deposited during the nucleus’s formation. If so, then these onion layers should form concentric rings around their parent body’s center of mass. If the nucleus began as one object, then the strata will encircle one center; if it began as two, then the strata in the duck’s head and body will be oriented around different centers of mass, each in their respective lobes. The team traced out the strata’s surfaces and extrapolated where the onion center was. They found that the layers do encircle two different centers, one in each lobe. Thus, Comet 67P’s nucleus formed in a low-speed collision of two nuclei. 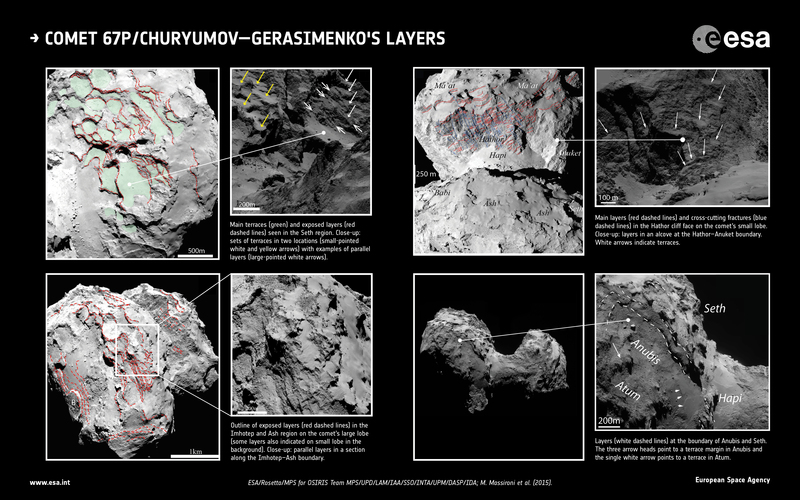 But the result also shows that the two objects — which we could now call Churyumov and Gerasimenko — formed in a similar way, accreting layers over time. Layering observed in other comet nuclei during flybys hints that Churyumov and Gerasimenko aren’t the only ones to have formed this way, study coauthor Björn Davidsson (Uppsala University, Sweden) says in the ESA press release. Reference: M Massironi et al. “Two independent and primitive envelopes of the bilobate nucleus of comet 67P.” Nature. Published online September 28, 2015.